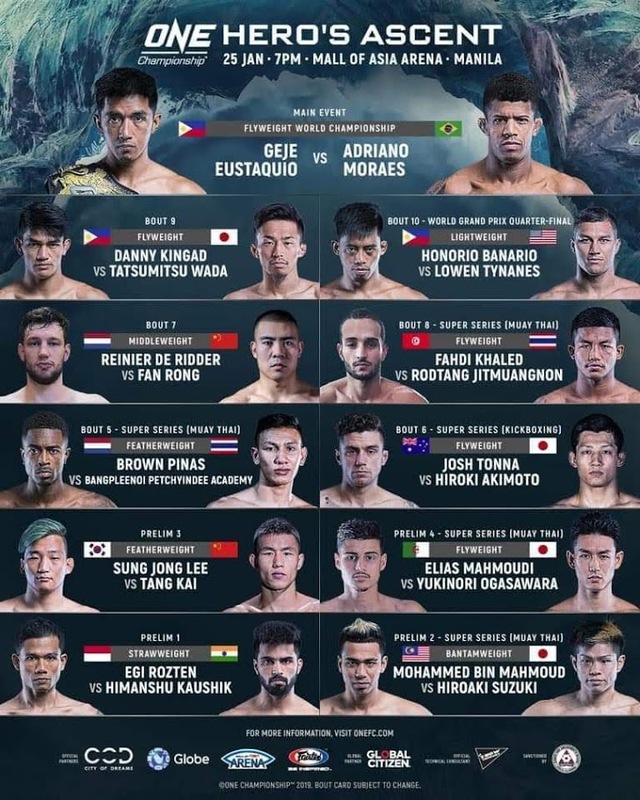 The first Manila bout of ONE Championship will be happening this Friday, January 25, 2019 at SM MOA Arena. The main bout will feature Geje Eustaquio, Danny Kingad, and Honorio Banario of Team Lakay. Now we all know that last week, Team Lakay suffered losses back to back with Edward Kelly and Joshua Pascio. This should drive Eustaquio, Kingad, and Banario to do better and make up for the losses that Team Lakay suffered but the question is, will they be able to turn things around? This will be the third time that these two top Fly Weight martial artists will be going head to head. The last match they had was a classic 5 round fight which was so close but the Filipino Geje Eustaquio came up victorious with a razor-thin split decision. Here's the complete list of fights for January 25, 2019 for ONE Hero's Ascent.